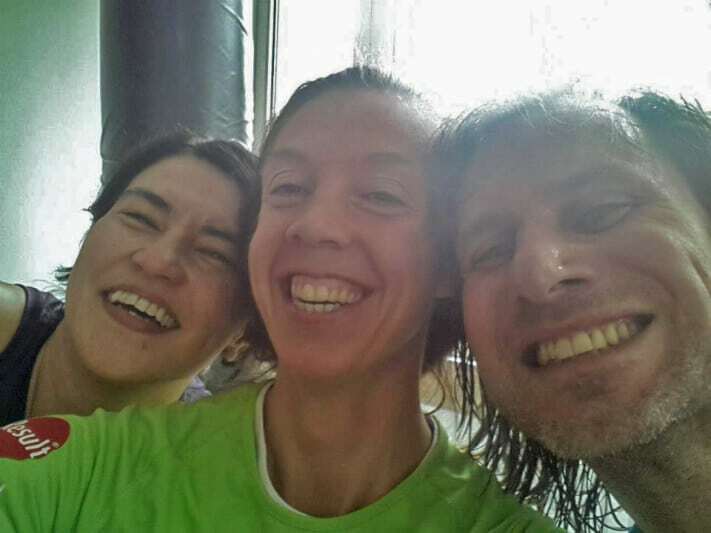 Expat couple Katrin (41) and Jon (42) train together once a week at Health Get Things Done. It all started when Katrin met Naomi in a green plastic bag. No kidding! She just bought a t-shirt at Meevers sport and in the bag she found a flyer from Health Get Things Done. She liked the entrepreneurial spirit and that sparked her interest. She’s been training at Health Get Things Done for almost a year now and a few months ago her husband Jon joined her. 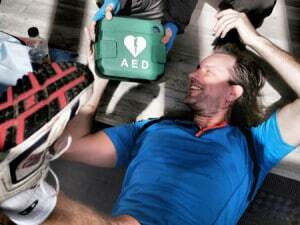 He really needed it too: regularly he has to lie down during training in order not to faint. He isn’t fit enough yet to keep up with his wife. It even inspired him to write a poem about his trainer! 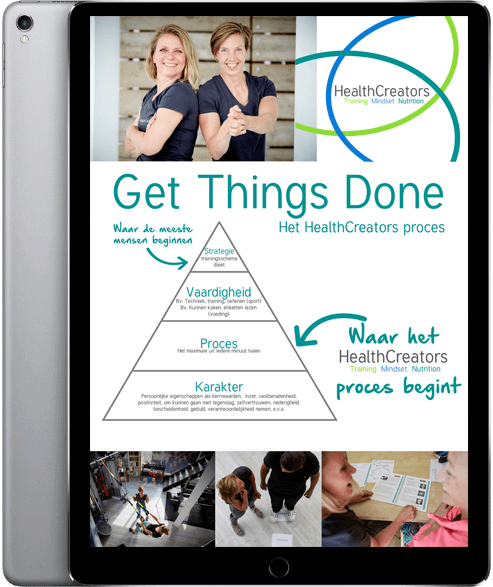 Why did you start with training at Health Get Things Done (the predecessor of HealthCreators)? Katrin: I had a very painful injury to my back. A dislocated rib. I had to go to the chiropractor every month to put it back into place. I work in IT and after a day at my desk I would be in agony. I couldn’t travel anymore, not for leisure but also not for work. Carrying a laptop around would be too heavy for me. Jon suggested that I would start to exercising, to strengthen the muscles. So I had to start doing something that I hate: sports! First I tried pilates for a year, with an instructor on a set time in the week. I kept up with it because I had an appointment, someone who was waiting for me. Because if you leave it up to me, I would never go. I didn’t like the pilates and I didn’t get the results I was after. That’s why I started the personal training. Because I did learn that I needed an appointment, someone who would hold me accountable. That’s how I found Naomi, on the leaflet in the plastic bag from the sports shop. Katrin: One day I just broke down and cried, because I thought it was too hard. I needed my energy for work, not for this difficult sports stuff! Naomi and I made a new plan and that worked much better. Even the impossible happened: I started to like it! Jon: A few months back I joined Katrin in training. Up until my 20th I did a lot of sports: cycling, swimming, weight training. When I started working, it gave up on it. When my pants would be too tight, I would exercise for a while. When the pants were okay again, I would stop. Like a yo-yo. But it had all been getting a bit out of hand lately. I hadn’t been doing anything for too long. I was tired, I had trouble climbing the stairs. I didn’t want to turn into a weak old man, I wanted to age into one of those fit old men. Katrin: He is just like me. Jon loves the sofa and hates sports. Jon: That’s why I joined her. The first session Naomi almost had to call an ambulance. I have very low blood pressure, but gave it all on the fit test anyway. I nearly fainted, had to lie down, feet up, grasping for air. That also served as a wake up call. Jon: I have no need to enrol in any kind of race. We both want to get fit on order to enjoy life. I don’t want to moan when I get up from a chair, I want to carry the groceries up the stairs without getting exhausted. A secondary goal is being able to go to the beach and be proud how I look. Or at least not self conscious. Katrin: I run, almost every day for half an hour. I do that to manage my weight. Since we both passed 40 we noticed that it gets harder to keep the extra pounds off. But that isn’t the main goal for me. I want to be able to keep a job, to do my work with energy, whatever the task at hand might be. So going on a trip carrying heavy stuff should not be a problem. Training with Naomi helps me with that. Jon: And it also keeps your skeleton together. What do like to do in training and what do you hate? Katrin: There are a couple of exercises I enjoy, like the rocker. I do those, while Naomi is attending to Jon when he is grasping for air again. I don’t enjoy boxing that much. I am not an aggressive person and I usually don’t need to vent any frustration. I started to like it a bit more when we do boxing together. Jon: I do like the boxing, especially the kicking. I like sports the best when it doesn’t feel like doing fitness exercises. I get inspired by Rocky movies. When he gets fit by chopping wood and wins from the Russian guy with all the high-tech stuff. That’s my kind of training! 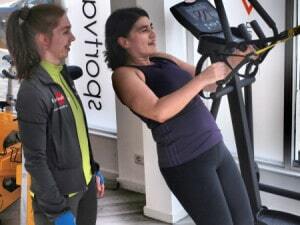 Katrin: I also hate it when Naomi makes me use right form, because the exercises can be painful then. If I do them my way they are much easier and hardly hurt. Too bad that my way doesn’t give the same results as her way, hahaha. What do you do differently now? What are the most important lessons you learned from Naomi? Jon: That I have to eat before training. She doesn’t like my attitude towards nutrition at all. Usually I skip breakfast and lunch. That is a pattern that started at uni and because of busy work schedules. Now, before training Naomi always wants to know what I ate and when. It’s also important to keep me from fainting. I noticed that when I have eaten well I can get through training much easier. But still, I haven’t really changed my habits on the non-training days… I did give up smoking little cigars. I used to have 3 or 4 before I even started my working day. Naomi really pressured me to quit. It’s been a few weeks now and I haven’t noticed much in lung volume up till now, but I am getting my sense of smell back. Tell a funny training story…. Katrin: During my first training session I could hardly do the exercises. After less than a minute doing a plank I would start shaking a lot. Naomi would say: You don’t have to wobble that much! Using the same tone of voice she uses to explain something. Luckily, now I am stronger and I really stopped wobbling around the studio.